Home / Activities To Keep The Kids Entertained This Easter Weekend! Activities To Keep The Kids Entertained This Easter Weekend! In need of some entertaining ideas for the long weekend? Why not plan some creative crafts you can do at home with your family to prepare for Easter Sunday! Sitting together being creative makes important memories that will last even longer than the craft itself. This easy and inexpensive project is fun for the whole family. 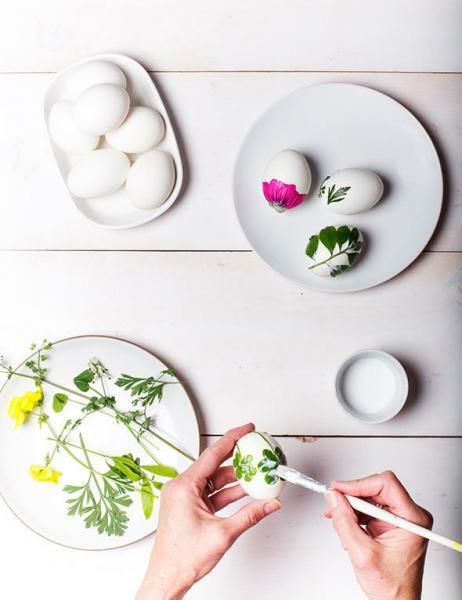 Materials required include eggs, fresh leaves, herbs or flowers and watered down craft glue. Simply cover the general area you want to place the foliage in glue. Then gently place the foliage on the glue area and add more glue on top (cut off stems as they tend to be tricky). This holiday project will enhance the look of any dinner table and also doubles as a gift idea that will impress friends and family. The Edible Paper Mache Easter Egg Piñata makes the perfect centrepiece for Easter entertaining or as a wonderfully playful cake substitute. It’s a fun way to celebrate all the pretty themed sweets of the Easter season like chocolate mini-eggs and flavoured jelly beans– and an absolute hit with the kids! Made of vanilla royal icing and wafer paper, it’s also a giant sweet itself! Once you’ve cracked your giant egg you can keep it on your kitchen island to nibble on as you please! For a full tutorial on the relatively easy egg-creation process visit dessert blog Sprinkle Bakes. Baking with your kids is another fun activity for the Easter weekend and there are so many incredibly cute Easter treats to choose from. We think these coconut bunny cupcakes are super cute and sure to bring a smile to your family’s faces! Do you have any fun activities already planned for the Easter weekend? Let us know what you do with your family?